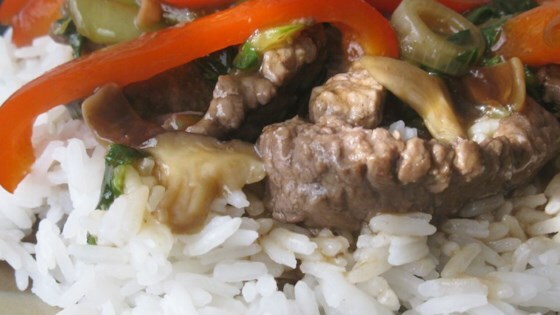 "Tender beef strips are quickly stir-fried with crisp and colorful vegetables to make this delicious restaurant-style dinner in your own kitchen." Mix cornstarch, broth, soy and sugar until smooth. Set aside. Heat 1 tablespoon oil in saucepot or wok over high heat. Add beef in 2 batches and stir-fry until browned. Set beef aside. Add 1 tablespoon oil. Add the mushrooms, cabbage, peppers, celery and green onions in 2 batches and stir-fry over medium heat until tender-crisp. Set vegetables aside. Stir cornstarch mixture and add. Cook until mixture boils and thickens, stirring constantly. Return beef and vegetables to saucepot and heat through. Serve over rice. Chicken broth and stock are heavy hitters for your holiday feast. TIP: To make slicing beef easier freeze beef for 1 hr. MAKE AHEAD: Prepare vegetables and place in resealable plastic bags. Refrigerate overnight. YUMYY! I didn't have shitake mushrooms on hand so I just used regular button mushrooms. This was a big hit! Will make again! Fabulous! Even my pickiest child loved it! Marinated the meat in 1cup soy, 2TBS chopped garlic, and 1/4cup lemon juice. Tenderizes the meat nicely. great recipe!!!! i loved it. It felt like I was eating at a fancy asian restaurant....but even better!!!!! and I cooked it all by myself!!!!! This recipe was simple, easy but taste amazing. I even screwed up and forgot to add the broth and it still turned out amazing. this was very good, however i made it easy on myself and used frozen stir fry vegs.